Back in the days we used the historic one-year lectionary (i.e. when we used The Lutheran Hymnal), this Sunday was called Laetare. It is a Latin word and means “rejoice.” It was taken from the first word of the old Introit of the Day, which translated is “Rejoice, Jerusalem.” The Introit for this Sunday, in series C, begins with the words, “Have mercy on me.” So the old name doesn’t fit. Today we know it as the Fourth Sunday in Lent, or simply Lent 4. Because we are getting deeper into the Lent season, our worship strips away more and more of the celebratory features. This Sunday we will again omit the Hymn of Praise and use the Lenten Verse instead of the Alleluia Verse. We will also speak the Kyrie and the Salutation. Starting with Lent 5 almost all our service will be spoken. Every year I personally struggle with this tradition when we reach Holy Week. The tradition says to keep music and song to a stark minimum. However there are so many wonderful pieces, set in minor keys, which perfectly reflect the tenor and sentiment of the days that it seems a real shame to overlook them. As I have not yet designed our Holy Week services, I can’t tell you how I’ve resolved my annual angst over the design of the services. At any rate, song returns with Easter. The sermon is titled “A Closer Look” and we will be taking a closer look at the Gospel lesson, which is the story of the Prodigal Son. The text will be Luke 15:11. Our appointed lessons are: Isaiah 12:1–6, 2 Corinthians 5:16–21, and Luke 15:1–3, 11–32. One final note before we get to the scripture readings and some initial thoughts. The April newsletter is finished. 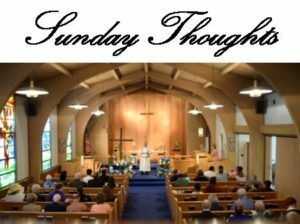 It has been posted on the blog (http://ourredeemernewark.org/our-redeemers-voice-newsletter/) and print copies will be available this Sunday for those who do not do the “internet thing.” And now, Sunday’s lessons. Initial Thoughts: For those of you who are attending our Wednesday Lent services, you will recognize this passage as the Old Testament Canticle we use in the Service of Prayer and Preaching. In verse two you will notice, in all capitals, the words “Lord God.” Whenever you see the words “Lord” or “God” in all capitals, in a standard English translation, that is an indication that the word in Hebrew is the Divine Name. Typically that name is transliterated as “Yahweh.” However, in the Bible, the name of God is often shortened to “Yah,” especially when it is used in names. So, for example, the name “Jesus” (which is an English transliteration of a Latin transliteration of a Greek transliteration of the Hebrew name: Yah-ho-shoo-ah (or something close to that), means “Yah(weh) saves.” What we have in verse two is the rare occurrence of “Yah Yahweh.” Isaiah could not be more emphatic that it is the one and only true God of Israel, and the one and only true God of all, who saves. As we know that Jesus is the Savior of the world, we understand the name of our Lord Jesus as meaning something like “here is Yahweh, the Savior.” With this understanding, read the lesson from Isaiah again and notice how it is a powerful testimony to our Lord Jesus. On a separate note, I grew up in San Diego, California, and knew many people of Hispanic descent named “Jesus.” They receive this name in honor of our Lord, and make no pretensions of being God in the flesh come to save us poor condemned sinners. 16 From now on, therefore, we regard no one according to the flesh. Even though we once regarded Christ according to the flesh, we regard him thus no longer. 17Therefore, if anyone is in Christ, he is a new creation. The old has passed away; behold, the new has come. 18All this is from God, who through Christ reconciled us to himself and gave us the ministry of reconciliation; 19that is, in Christ God was reconciling the world to himself, not counting their trespasses against them, and entrusting to us the message of reconciliation. 20Therefore, we are ambassadors for Christ, God making his appeal through us. We implore you on behalf of Christ, be reconciled to God. 21For our sake he made him to be sin who knew no sin, so that in him we might become the righteousness of God. Initial Thoughts: First, this lesson is a powerful affirmation of the understanding of the name of Jesus presented in the Initial Thoughts on our Old Testament lesson. When Paul speaks of how he once regarded Christ according to the flesh he means that he didn’t understand the idea presented in the name of Jesus explained in the Initial Thoughts on our Old Testament lesson. He saw Jesus as only human. So people still consider Jesus as only human, even if they call him a great prophet, a great moral leader, a great … (whatever). It they do not get “God in the flesh come to earth to be our Savior,” they just don’t get it at all. The vocabulary about being a “new creation” and being “in Christ,” is baptismal language. Blessed in baptism we are in Christ and new creations. As new creations we have a purpose, which is to be share the message of reconciliation. This doesn’t negate our other vocations, like parent, child, citizen, neighbor, etc., but it does inform us in how we carry out those vocations. 11 And he said, “There was a man who had two sons. 12And the younger of them said to his father, ‘Father, give me the share of property that is coming to me.’ And he divided his property between them. 13Not many days later, the younger son gathered all he had and took a journey into a far country, and there he squandered his property in reckless living. 14And when he had spent everything, a severe famine arose in that country, and he began to be in need. 15So he went and hired himself out to one of the citizens of that country, who sent him into his fields to feed pigs. 16And he was longing to be fed with the pods that the pigs ate, and no one gave him anything. 17 “But when he came to himself, he said, ‘How many of my father’s hired servants have more than enough bread, but I perish here with hunger! 18I will arise and go to my father, and I will say to him, “Father, I have sinned against heaven and before you. 19I am no longer worthy to be called your son. Treat me as one of your hired servants.”’ 20And he arose and came to his father. But while he was still a long way off, his father saw him and felt compassion, and ran and embraced him and kissed him. 21And the son said to him, ‘Father, I have sinned against heaven and before you. I am no longer worthy to be called your son.’ 22But the father said to his servants, ‘Bring quickly the best robe, and put it on him, and put a ring on his hand, and shoes on his feet. 23And bring the fattened calf and kill it, and let us eat and celebrate. 24For this my son was dead, and is alive again; he was lost, and is found.’ And they began to celebrate. Initial Thoughts: Verses four through ten are omitted in our reading. Those verses contain the parables of the lost sheep and the lost coin. The parable in our reading is often called the Parable of the Prodigal Son. That is a misnaming, in my opinion. It omits two of the major characters in the story, the son who stayed home and the Father. Perhaps we should call it the “Parable of the Father and His Two Sons.” This is a pivotal chapter in Luke. The three parables, taken together, present God as the loving, patient and seeking Lord, who desires the salvation of all. We will explore the parable in verses 11-32 in greater detail on Sunday.